Approximately 2,700 RVs will take part in FMCA's 97th International Convention, which has been dubbed “Southern Charm,” March 15 through 18 in Perry, Georgia. 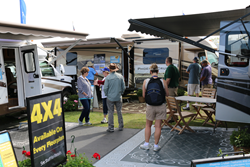 An RV expo takes place during each FMCA convention. RVs in a variety of types, sizes, and price ranges will be on display, making this an ideal event for someone considering purchasing an RV. All RV owners are invited to take part in FMCA's “Southern Charm" event in March. Approximately 2,700 RVs are expected to attend the event. When they aren’t shopping, attendees can take part in seminars about topics ranging from towing a vehicle behind a motorhome to microwave-convection cooking. Approximately 100 different sessions will be held, so plenty of educational opportunities will present themselves. FMCA is an international organization for families who own and enjoy the use of self-contained recreation vehicles. The association maintains its national headquarters in Cincinnati, Ohio, and currently has more than 75,000 active member families. FMCA offers its members a number of benefits, including a subscription to its monthly magazine, Family Motor Coaching; a medical emergency and travel assistance program valued at $105 per family; group rates on a roadside assistance program and on motorhome and auto insurance; discounted rates for RV tours and caravans; and a tire purchasing program. Perhaps the most important benefit of FMCA membership is the camaraderie and friendships that develop among people enjoying the common interest of RV travel. The organization can be reached at (513) 474-3622 or (800) 543-3622 and on the Web at FMCA.com.